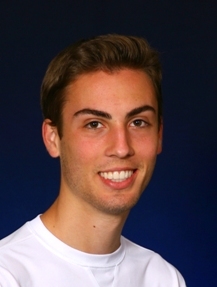 Co-captain Dave Sorensen ran second for Tufts and fourth overall. GRAFTON -- The Tufts University men's cross country team hosted NESCAC opponents Bowdoin College and Bates College in a three-team Jumbo Invitational on Saturday afternoon at the Farm Course on the campus of the Tufts University Veterinary School. Bowdoin College won the meet with a score of 26 points, taking the top two spots with Thompson Ogilvie running the eight-kilometer course in 27 minutes, 4.84 seconds and John Hall recording a 27:10.20 finish. Sophomore Jesse Faller (Burlington, MA) led the Tufts contingent in third place individually with a 27:12.44 time. Senior co-captain Dave Sorensen (Dover, MA) was right on his heels in 27:13.59 for fourth place. The Jumbos took second place as a team with a score of 49. Freshman Greg Pallotta (Syracuse, NY) earned a 10th place finish (27:44), while sophomore Nick Welch (Seattle, WA) and freshman Jeff Ragazzini (Wilton, CT) also scored for Tufts with times of 28:04.81 and 28:39.12, respectively. Bates College at 54 points finished third in the meet. The Bobcats were led by Matt Dunlap in sixth place with a 27:25.55 time.